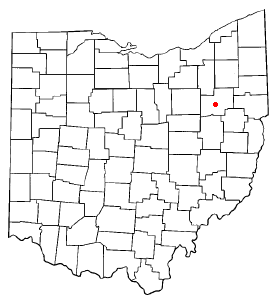 Canton is located approximately 24 miles (39 km) south of Akron, and 60 miles (97 km) south of Cleveland, in the northeastern part of Ohio. Canton lies on the outskirts of the greater northeast Ohio metropolitan area anchored by Cleveland, and is also a short distance away from the periphery of the greater Pittsburgh area. The city serves as a gateway to Ohio's extensive Amish country, particularly in Holmes and Wayne counties to the city's west. Canton is located along the historic Lincoln Highway, the present-day Interstate 77, U.S. Route 30 and U.S. Route 62, and is also the terminus of the Cuyahoga Valley Scenic Railroad. As of the 2010 Census, the city of Canton is the largest incorporated area in the Canton-Massillon Metropolitan Statistical Area (CMMSA), which includes all of Stark and Carroll counties. The CMMSA reported a population of 404,422. Canton's city population declined 9.7%, down to 73,007 residents. Despite this decline, the 2010 figure actually moved Canton from ninth to eighth place among Ohio cities. Nearby Youngstown in Mahoning County, once considerably more populous than Canton, suffered a larger decline. Most outside attention given to Canton is focused on two things. The first is football, especially the Pro Football Hall of Fame and the formation in 1920 of what eventually became the National Football League. The second is William McKinley, who conducted from his home in Canton the famed front porch campaign which won him the presidency of the United States in the 1896 election. The McKinley National Memorial and the William McKinley Presidential Library and Museum commemorate his life and presidency. Canton was chosen as the site of the First Ladies National Historic Site largely in honor of his wife, Ida Saxton McKinley. Canton was founded in 1805. Cantonrep.com quotes Kim Kenney, the curator of the William McKinley Presidential Library & Museum, whose information came from E.T. Heald's series, The Stark County Story, as saying that Canton was incorporated as a village in 1822, and then as a city in 1838. Canton has a humid continental climate (Köppen climate classification Dfa), typical of much of the Midwestern United States, with very warm, humid summers and cold winters. Winters tend to be cold, with average January high temperatures of 33 °F (1 °C), and average lows of 19 °F (−7 °C), with considerable variation in temperatures. During a typical January, high temperatures of over 50 °F (10 °C) are just as common as low temperatures of below 0 °F (−18 °C). Snowfall is lighter than the snowbelt areas to the north. Akron-Canton Airport generally averages 47.1 inches (120 cm) of snow per season. Springs are short with rapid transition from hard winter to warm, sometimes humid and muggy summers. Summers tend to be warm, sometimes hot, with average July high temperatures of 82 °F (28 °C), and average July low of 62 °F (17 °C). Summer weather is more stable, generally humid with thunderstorms fairly common. Temperatures reach or exceed 90 °F (32 °C) about 9 times each summer, on average. Fall usually is the driest season with many clear, warm days and cool nights. The all-time record high in the Akron-Canton area of 104 °F (40 °C) was established on August 6, 1918, and the all-time record low of −25 °F (−32 °C) was set on January 19, 1994. As of the census of 2010, there were 73,007 people, 29,705 households, and 17,127 families residing in the city. The population density was 2,867.5 inhabitants per square mile (1,107.1 /km2). There were 34,571 housing units at an average density of 1,357.9 per square mile (524.3 /km2). The racial makeup of the city was 69.1% White, 24.2% African American, 0.5% Native American, 0.3% Asian, 1.0% from other races, and 4.8% from two or more races. Hispanic or Latino of any race were 2.6% of the population. Canton works under a mayor–council government and it is the largest city in Ohio to operate without a charter. The city council is divided among nine wards with three at-large seats and the council president. The current mayor is William J. Healy II, a Democrat who is currently in his second term. The Canton area's economy is primarily industrial, with a significant agricultural segment. The city is home to the Timken Company, a major manufacturer of tapered roller bearings and specialty steel. Several other large companies operate in the greater-Canton area, including the Belden Brick Company (brick and masonry producer) and Diebold (ATMs, electronic voting devices, and bank vaults). The area is also home to several regional food producers, including Nickles Bakery (baked goods), Case Farms (poultry), and Shearer's Foods (snack foods). Poultry production and dairy farming are also important segments of the Canton-area economy. As in many industrial areas of the United States, employment in the manufacturing sector is in a state of long-term decline. LTV Steel (formerly Republic Steel) had been a large employer before its bankruptcy in 2000. In 2004, the Timken Company proposed moving its Canton-based bearing production to plants in the South. While Timken's steel production remains centered around Canton, this has struck a blow to the economy and the city's image and pride. The Hoover Company (vacuum and floor cleaners) had been an iconic part of North Canton for more than 50 years. It was purchased by Techtronic Industries Co Ltd from the Whirlpool Corporation in January 2007, resulting in the June 2007 closure of the original North Canton site. In response to these manufacturing losses, the area is undergoing a transition to a retail and service-based economy. Canton is part of the greater Cleveland radio and television media market. However, due to its proximity to Youngstown, it is not uncommon for residents to receive stations from that area as well via over-the-air television transmissions. 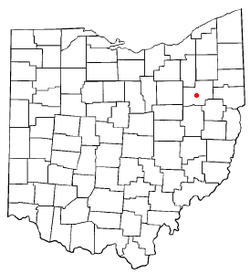 Akron-Canton Regional Airport (IATA: CAK, IACO: KCAK) is a commercial Class C airport located 10 miles (16 km) north of the city and provides daily commercial passenger and air freight service. James Karales, major civil rights era photographer. Joe Vitale, musician, drummer and keyboardist who has played with Joe Walsh, Eagles, Crosby, Stills & Nash, Michael Stanley Band and many others. Mike Hartline, former quarterback for the Kentucky Wildcats football team, member of New England Patriots, brother of Brian Hartline. Kosta Koufos, basketball player formerly of the Utah Jazz currently for Denver Nuggets and Greece national team, former Ohio State Buckeyes basketball player. ^ "Driving Directions from Canton, Ohio to Akron, Ohio". Mapquest. June 5, 2007. http://www.mapquest.com/directions/main.adp?go=1&do=nw&rmm=1&un=m&cl=EN&ct=NA&rsres=1&1ffi=&1l=&1g=&1pl=&1v=&1n=&2ffi=&2l=&2g=&2pl=&2v=&2n=&1pn=&1a=&1c=Canton+&1s=OH&1z=&2pn=&2a=&2c=Akron&2s=OH&2z=&r=f. Retrieved June 5, 2007. ^ "Driving Directions from Canton, Ohio to Cleveland, Ohio". Mapquest. June 5, 2007. http://www.mapquest.com/directions/main.adp?go=1&do=nw&rmm=1&un=m&cl=EN&ct=NA&rsres=1&1ffi=&1l=&1g=&1pl=&1v=&1n=&2ffi=&2l=&2g=&2pl=&2v=&2n=&1pn=&1a=&1c=Canton+&1s=OH&1z=&2pn=&2a=&2c=Cleveland&2s=OH&2z=&r=f. Retrieved June 5, 2007. ^ a b "Census shows sharp population decline in Canton". CantonRep.com. http://www.cantonrep.com/news/x1777797393/Cantons-population-plunges-9-7-percent-in-2010-Census. Retrieved March 11, 2011. ^ CantonRep.com and About Us – General Information. City of Canton, Ohio. ^ "Geographic Names Information System entry for Canton". http://geonames.usgs.gov/pls/gnispublic/f?p=gnispq:3:::NO::P3_FID:1048580. Retrieved January 13, 2007. ^ "Weatherbase: Historical Weather for Akron, Ohio". http://www.weatherbase.com/weather/weather.php3?s=12527&refer=. Retrieved November 10, 2008. ^ a b "NowData - NOAA Online Weather Data". National Oceanic and Atmospheric Administration. http://www.nws.noaa.gov/climate/xmacis.php?wfo=cle. Retrieved 2013-11-24. ^ "Mayor William Healy – Official Biography". City of Canton. http://www.cantonohio.gov/mayor/?pg=mayor. Retrieved April 3, 2010. ^ a b Gumbrecht, Jamie (July 23, 2008). "Colbert's 'crappy Canton' comment puzzles mayor". The Atlanta Journal-Constitution. http://www.ajc.com/metro/content/metro/cherokee/stories/2008/07/23/colbert_canton_comment.html. ^ Crawley, Paul (July 31, 2008). "Colbert Apologizes To Canton... Sort Of". WXIA-TV. http://www.11alive.com/news/local/story.aspx?storyid=119248&catid=3. ^ "Stephen Colbert slams Canton, Kansas". Kansas City Star. July 31, 2008. http://www.kansascity.com/238/story/728196.html. "In "apologizing" to Canton, Ga., on Wednesday's "The Colbert Report," Stephen Colbert slammed Canton, Kan."
^ "Google maps goof calls Canton, Ohio, ’Colesville’". Arizona Daily Star. Associated Press. October 27, 2009. http://www.azstarnet.com/sn/hourlyupdate/314951.php. Retrieved November 8, 2009. ^ Pritchard, Edd (October 27, 2009). "Mr. Wells called it Canton, Google calls it Colesville". The (Canton) Repository. http://www.cantonrep.com/communities/canton/x23524235/Mr-Wells-called-it-Canton-Google-calls-it-Colesville. Retrieved November 8, 2009. "Folks at Google offices in California already have heard rumors that the name change somehow is related to the McKinley-Massillon football game this weekend. That’s not the case, Filadelfo said several times. “It’s simply an error when the map was being labeled,” she said." This page uses content from the English language Wikipedia. The original content was at Canton, Ohio. The list of authors can be seen in the page history. As with this Familypedia wiki, the content of Wikipedia is available under the Creative Commons License.